1.09" x 0.65" x 0.34"
Pros: Works both USB2 HOST and Micro USB device. Low profile if using on a USB port on a car stereo. Cons: Delicate, cover can come off. Other Thoughts: This thing is way cool. Plug it into your computer - load it up with stuff, plug it into your phone and it works. Other folks complain about them not lasting but I use these daily on my care stereo and after a few years is still working fine. Cons: Failed with critically important files. No way to recover files or even to reformat. We apologize for the experience you had with your product. We very much would like to assist and we have created a case, SR308697, please contact us at, Kingston Techincal Support line: (800) 435-0640 (714) 435-2639 Monday - Friday 6 a.m. - 6 p.m. PST, and we can further assist. Thank you for using Kingston Technology as your upgrade partner. Cons: Finicky at USB 3.0 (works on Windows 8.1 but not Windows 7 Home even after updating USB drivers). Fails to connect as USB3 in two computers I tried (USB3/blue sockets). Other Thoughts: My 1st 1 egg review ever. In years. Hello, I'm Jewel with Kingston Technical Support. We apologize for the issue experienced with the DT Duo 3.0 flash drive. The drive should have a write speed of 10MB/s in USB 2.0 and 3.0 ports. Considering the drive is not being recognized properly when connected to some USB 3.0 port there may be an issue with the drive that you received. We stand by all our products and can replace the drive under it's five year warranty. Please call us at 1-800-435-0640 (USA and Canada only) M - F 6am - 6pm PT and I or another available Technician will assist you. Thank you for selecting Kingston as your upgrade partner. Pros: Lots of gigabytes for your dollar. Very small. Cons: Surprisingly slow, especially for USB 3.0. Get repeated messages that it would be faster in a USB 3 slot, even when installed in USB 3 slot. No dust cap. Other Thoughts: Checked the Kingston website on the off chance of firmware fix but no luck. Haven't tried the micro USB OTG function yet. Might be the saving grace for this little drive. Hello, I'm Jewel with Kingston Technical Support. We apologize for the issue experienced with the DTDUO3 microUSB/USB drive. We stand by all our products and can troubleshoot with you to determine if the drive is performing properly. 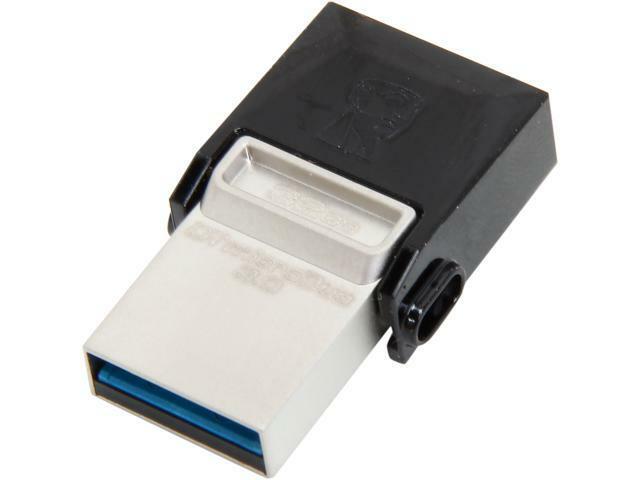 This drive offers speeds of 70MB/s read and 15MB/s write, in USB 2.0 the read would be limited to 30MB/s and the write should be relatively the same. If you have any other USB 3.0 devices, test to see if you get the same error in the same port. If it does, than I would recommend looking into driver updates for your computer such as BIOS and chipset driver updates as those would affect the port's functionality. If using in the front or case USB ports on a desktop try the ones in the back of the computer as the front ports have have variable power which can cause drives to malfunction. For any further assistance, please call us at 1-800-435-0640 (USA and Canada only) M - F 6am - 6pm PT and I or another available Technician will assist you. Pros: Great way to transfer files from my phone directly to my car. I keep the USB stick in my car, and when I buy new music, I download to my phone, transfer to usb, and plug usb into my car. Bluetooth issues? Forget about 'em. Love the small form factor too. Cons: I have concerns about the long term viability of the flip cover, but other than that no cons. Pros: Just got it in. * So far it seems to provide approximately the advertised read/write speeds. I was definitely getting at least 15 MB/s write on USB3, but I haven't timed the read very well yet because the files are copied too quickly. * Came formatted as Fat32, worked out of the box with my Samsung Galaxy S3. * Reformatted as ExFat, still works with my phone. * Came with a small loop for attaching to a keychain, sturdier than other drives I've had on my keychain. * Doesn't come with weird partitions or bloatware like a Sandisk. * The microUSB cap is pretty easy to remove and put back on without fear of breaking anything. Cons: * The microUSB connector does not have good retention. I recommend laying it on a flat surface to plug into another device, and then leaving it there while in use. Easily falls out of my phone's microUSB port. * The cap on the microUSB is not the most convenient in my situation, I have to remove it in order to plug it into my phone while on a flat surface due to the orientation of my phone's USB port. Not annoying enough to knock off an egg. * The microUSB port seems like it might fall off after extended use, it is not directly supported by the casing, and there is a visible gap between the case and the edges of the microUSB connector. From what I can tell, the drive internals are inserted as a single piece into the shell, and the only thing holding the microUSB connector on is solder. I'll have to make sure to be careful with it and keep up with the protective cap. * Gets fairly warm to the touch, even while just plugged in and not in use, but the metal body dissipates the heat pretty quickly. Other Thoughts: * The keychain loop could be of higher quality, I wouldn't expect it to be able to hold more than about 5 or 10 pounds before breaking. If it gets caught on something, I could see that failing first. * I've only had this for a day so far, but I really like it. The compact size, high capacity, and USB 3.0 are very convenient. I purchased this drive to act as a replacement for cloud storage which I don't want to pay a subscription for. This drive can hold my approximately 15 GB of pictures, books, parts of my music collection, and documents with plenty of room left over for moving around large files. Since it can plug into my phone and work perfectly (even without root), this negates the need for me to use Dropbox or Google Drive to keep up with my files.